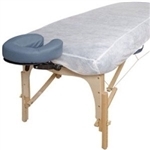 Give your customers the ultimate massage experience by investing in quality table warmers, cotton spa blankets, fleece blankets, soft to the touch top and bottom sheets and other massage bedding and bed sheets. If disposable is what you are looking for than check out our disposable drape sheets, bed cover rolls, polly-sheets and individual bed sheets. But at Source One Beauty we don’t overlook the details, in our store you will also find disposable and reusable head rest covers as well. We understand that hygiene and comfort are important for your clients, in turn important to you, and therefore, important to us.